73 yo F with PMHx significant for anxiety BIBA for syncopal episode and hyperventilation. EMT noted a systolic BP of 80s which initially responded to a fluid bolus. Pt c/o SOB but denies any recent fever, chest pain, travel, immobilization, trauma, leg swelling or abdominal pain. CARD: S1, S2 normal; no murmurs, gallops, or rubs. + tachycardia. 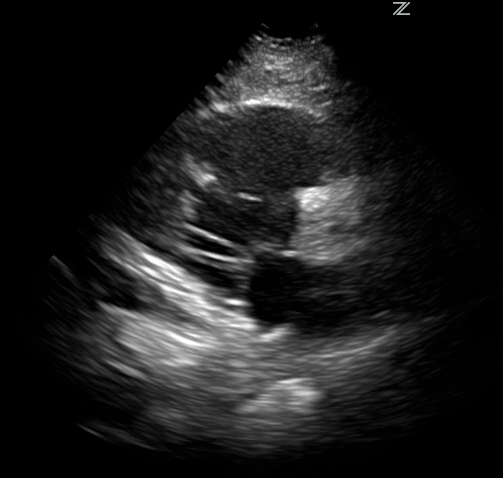 What information can a cardiac ultrasound give us in this patient? Which cardiac chambers are seen in Figures A and B? What is the positive finding in these cardiac views? What is the differential based on patient presentation and ultrasound? 1. Cardiac ultrasound can assess for pericardial effusion with/without tamponade physiology, decreased motility as evidence for CHF and/or right ventricular strain. 2. Right ventricle, left ventricle, left atrium, aortic outflow tract can be seen in the parasternal long axis view. Right atrium cannot be seen. Increasing the depth may allow for visualization of the descending aorta. Visualization of the descending aorta allows for differentiation of pericardical effusion versus pleural effusion. 4. Differential of right ventricular strain on cardiac ultrasound includes pulmonary thromboembolism, cor pulmonale or pulmonary hypertension. Right ventricular strain can also be seen in chronic COPD patients. Our patient was positive for bilateral segmental pulmonary emboli.